One hundred years ago, on a cold fall afternoon, you could find young men tossing a pigskin around on the University of Windsor (then Assumption College) campus. But not until half a century later did football become an official varsity sport. Legendary coach Gino Fracas helmed the first team, which took the field in 1968. He brought a track record of success to the role. Fracas was a star running back at Assumption College Catholic High School and won two Yates Cup championships at Western University as a running back and linebacker. Fracas was the first overall Canadian Football League pick in 1954 and played for both the Ottawa Rough Riders and the Edmonton Eskimos, where he won two Grey Cups. 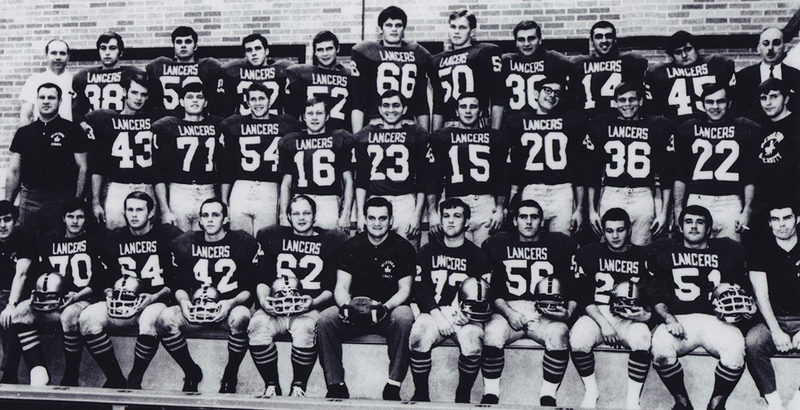 Under Fracas, the Lancers won a Central Canadian Intercollegiate Football Conference Canadian championship in 1969, quarterbacked by Andy Parici BA ’71, BComm ’91. In 1972 Parici threw for 4,606 yards and 34 touchdowns, winning the inaugural Hec Crighton Trophy. In 1975 Fracas’s team captured another championship, riding one of the most dominant defenses in OUA history to a Yates Cup. The ’75 defense gave up just 34 points against in seven games, a record that stands today. Coach Fracas was named Coach of the Year in 1976 and 1977 by the OUA. In 1979 quarterback Scott Mallender BHK ’80, BEd ’81, earned the second Hec Creighton honour. During his Blue and Gold career, Mallender threw for more than 5,000 yards and still holds the Lancer record for passing yards in a season with 1,821. In 1986 coach Fracas traded the sidelines of his local university for a lecture hall, leaving the coaching ranks but remaining a Lancer as part of the faculty. Just two years after his coaching retirement, the CIS named an award in his honour; the Gino Fracas Award presented to an outstanding Volunteer or Coach, in honour of the former player, coach, administrator and University of Windsor professor. Gerald Hlady BHK ’91, BEd ’92, made his mark on the Blue and Gold history books by becoming the first Lancer in program history to earn back to back first team all-Canadian honours with his performances at guard in the 1990 and ’91 seasons. Hlady is also the first and only three-time winner of Windsor’s DeMarco Trophy as top student-athlete. In 2004, one of the best players to ever don the Blue and Gold arrived on campus. Daryl Stephenson BHK ’04, MHK ’11, didn’t take long to prove he was a star, scoring a touchdown in his first game as part of his 25 carry, 161 yard CIS debut against Queen’s. That season after rushing for 1,192 and leading the CIS in rushing, he won the Norm Marshall Trophy as the OUA’s Rookie of the Year. Stephenson was the first player in CIS history to rush for more 1,000 yards in three consecutive seasons (2004-2006). He won the Hec Crighton Trophy in 2006 and 2008, the first and only CIS player to surpass the 5,000-yard mark. He still holds the CIS career-rushing crown with 5,163 yards. In 2011 former Lancer wide receiver Joe D’Amore BA ’00, returned to the Blue and Gold, this time as a coach. In his first year at the helm, he guided the Lancers to within one win of a Yates Cup appearance. D’Amore also cultivated Lancer standout Austin Kennedy, who sits fourth in OUA history for passing touchdowns in a career with 64. Today, D’Amore hopes to build up the program with one of the biggest recruiting classes in the OUA. Bringing in a host of receivers and linemen that stand more than six-feet-tall has the Blue and Gold primed to start the next 50 years of Lancers football off right!